I have recently bought a new camera for Astro use. 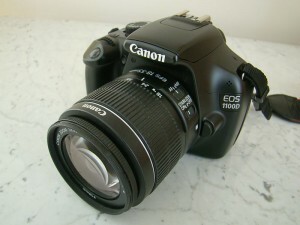 The Canon 1100D is a 12.2 Megapixel DSLR, that weighs just 495g (almost half that of my previous main astro camera, the Canon EOS 5D). I have had it modded by a trusted friend to make it more sensitive to the red end of the light spectrum. This end of the spectrum is that emitted by many reflection nebulae, and so this mod makes it much better for astro use than it would have been otherwise. There are actually two filters in this camera, LPF-1 and LPF-2. Removal of LPF-2 is what makes it more sensitive to the correct bit of the spectrum. It also messes up the colour balance and auto focus for normal use, but as this is a dedicated astro camera, I’m not bothered about that. Due to it being a recent acquisition, it hasn’t yet been truly tested in the field. Once it has been, I’ll report back, and obviously, the results will be winging their way onto the site too. The photo used here is licensed under the Creative Commons Attribution-Share Alike 3.0 Unported license. It is the work of indeedous.